Swedish count and officer (1755-1810). 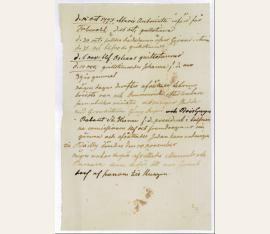 Single page of notes. No place or date. 8vo. 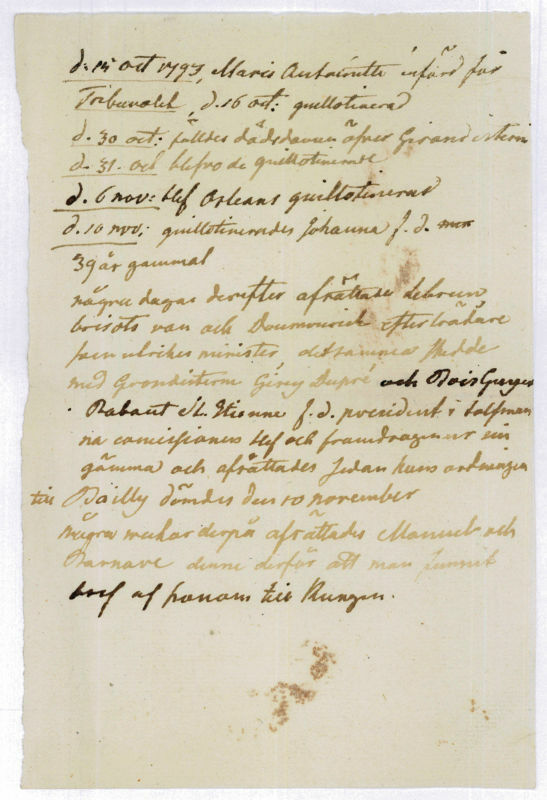 ¾ p.
Notes in Swedish recording the trial and execution of several persons between October 15 and November 10, 1793. The first of these is his beloved Marie Antoinette. - Hans Axel count Fersen had fought on the French side in the American Revolution; after his return to France in 1783 he had been made commander of the Royal Swedish Regiment in the French Army by Louis XVI. In the years from 1789 onwards, Fersen, long an ardent devotee of the Queen, soon became Marie Antoinette's sole remaining close friend, acting as a liaison between the royal couple and the Swedish monarch. When Louis and Marie Antoinette finally decided to flee with their children in June 1791, it was Fersen to whom they turned for help. He lent the King the necessary funds, obtained the coach and assisted in engineering the flight which so disastrously ended with the royal family's arrest in Varennes. The King and Queen were returned to Paris, and Marie Antoinette began a clandestine, dangerous correspondence with Fersen, who had escaped to Belgium. While there is no question that Fersen deeply loved Marie Antoinette (he probably became aware of a passionate side to his admiration only in 1790) and that his feelings were increasingly returned by the imprisoned Queen, popular tradition has styled Fersen as Marie Antoinette's long-time secret paramour - a myth debunked by Vincent Cronin in his biography of "Louis and Antoinette" (the single source for this story is an account in the highly biased and unreliable memoirs of the former minister Saint-Priest, whose own wife had indeed been Fersen's mistress for a while). However, Antoinette's loyal friend Fersen secretly returned to Paris in 1792 and spent the night in the Queen's prison-like apartment in the Tuileries, and several pieces of evidence suggest that the liaison, which had been forestalled by the events of 1791, was consummated on that night of 13 February 1792. After again escaping from France, Fersen continued to fight for Marie Antoinette's release - unsuccessfully. Fersen mourned her deeply. "The Queen's face, he wrote in his diary, 'follows me wherever I go. Her suffering and death and all my feelings never leave me for a moment. I can think of nothing else [...]'" (Cronin 392). He would never marry, but "lived quietly with his sister, remembering the past. He wished that he had accompanied the King and Queen on their flight and had been killed making possible their escape. The anniversaries of their deaths he remembered devotedly" (Cronin 394f.). - Slight brownstaining, but well-preserved. Provenance: Stafsunds-Auktionen, later sold at Kvalitetsbokauktionen 23 Nov. 1988, lot 6347. A unique association piece..